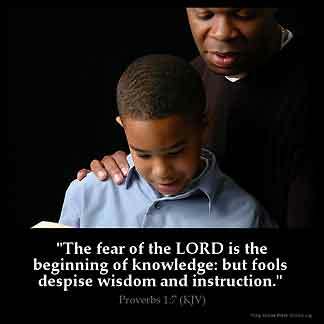 PROVERBS 1:7 KJV "The fear of the LORD [is] the beginning of knowledge: [but] fools despise wisdom and instruction." 4To give subtilty to the simple, to the young man knowledge and discretion. 5A wise man will hear, and will increase learning; and a man of understanding shall attain unto wise counsels: 6To understand a proverb, and the interpretation; the words of the wise, and their dark sayings. 7The fear of the LORD is the beginning of knowledge: but fools despise wisdom and instruction. 8My son, hear the instruction of thy father, and forsake not the law of thy mother: 9For they shall be an ornament of grace unto thy head, and chains about thy neck. 10My son, if sinners entice thee, consent thou not. � The feare of the Lord is the beginning of knowledge: but fooles despise wisedome and instruction. The fear of Jehovah is the beginning of knowledge; `But' the foolish despise wisdom and instruction. The fear of the Lord is the start of knowledge: but the foolish have no use for wisdom and teaching. The fear of Jehovah is the beginning of knowledge: fools despise wisdom and instruction. The fear of Yahweh is the beginning of knowledge; but the foolish despise wisdom and instruction. Fear of Jehovah [is] a beginning of knowledge, Wisdom and instruction fools have despised! The fear of the LORD is the beginning of knowledge; but the foolish despise wisdom and discipline. 1:7 The fear - Reverence and obedience to God. Beginning - The foundation without which all other knowledge is vain. Fools - That is, wicked men, are so far from attaining true wisdom, that they despise it, and all the means of getting it. The fear of god is foundation of everything. Acknowledge god 's almighty power, existence Because acknowledgement of god, I will obey god 's instructions, I will do everything god say but I will not do anything god doesn 't want us to do. Fearing God to me is a reverance for him, because of who he is and the love that he has for me, there is no greater love than his, if I am engraved in the palm of his hand. I think when they say there is no God, they are afraid, because they will have to answer for all the times they denied him, that 's the scaryvpart.